Sparkling Video artists Nasanel and Nancy Yachnes are passionate about capturing your simcha in a dynamic and meaningful way. You'll never want to stop watching the beautiful, cinematic documentary video that we create for you! And recently, we've teamed with Beto, an internationally-acclaimed photographer who excels in capturing the defining detail elements of your day to bring you complete wedding coverage. Get more for your wedding! 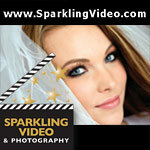 Don't forget to mention ChossonKallah.com when visiting Sparkling Video & Photography.